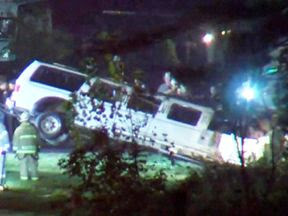 The limousine which crashed in upstate New York killing 20 people failed an inspection last month and its driver did not have a suitable licence, according to US media. The reports citing governor Andrew Cuomo come after one of the passengers reportedly complained of the limo's "terrible condition" moments before she died. Valerie Abeling said her newlywed niece Erin McGowan, who died along with her husband Shane, sent a text about the state of the stretch limousine. The vehicle, which was transporting 18 people going to a birthday party when it crashed into a parked car, was a last-minute replacement for a hired bus that had broken down. Mr Cuomo said the limousine had been rebuilt in a way which violated federal law, adding that the vehicle hire firm, Prestige Limousine, "has a lot to answer for". News agency calls to the company for comment on Monday were unanswered. The tragedy in upstate New York is America's worst transportation crash in almost a decade, according to federal authorities. Ms Abeling told the Washington Post her daughter recounted how the group had rented "some kind of bus" and that the travel provider sent a stretch limousine after the bus stopped working.